Just talked to doc everything went well. Details later. ... he's getting cut, tomorrow. Yes, bad, I know. But humor is helpful right now. Apologies to those who have donated who I haven't managed to thank yet, things have been a little crazy with prep and the like. Plus the massive panic on my end. No idea how long the surgery will be, the surgeon doesn't know the extent of the work needed until he gets in there. Right now the surgeon is only expecting an overnight stay, but that may change due to the extent of the surgery. I won't be posting live updates here most likely. I'll do a wrap up post here, but most of the updates will be on Facebook. 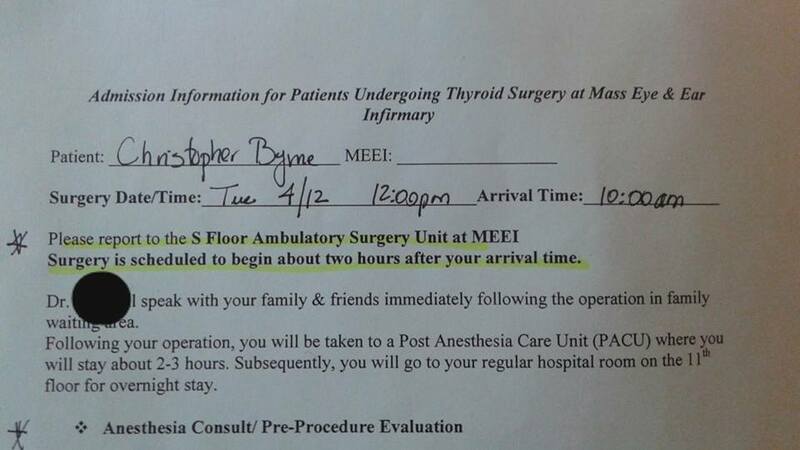 There's a Facebook group for those who can handle the more gruesome details here: Chris Byrne Surgery and Recovery. Anyone who joins will be accepted. One day we'll get around to a full explanation of what's going on, but right now I'm busier than the proverbial one legged man, if the one legged man was also taking care of a sick husband, a 3 year old, two dogs, a household, and a ton of medical details. Surgery now on Tuesday, due to scheduling and the surgeon wanting some test results back first. Details to follow, when we're not as exhausted and can go into medical details coherently.